The battle rages. Disposable razors versus electric shavers. Disposable razor companies will tell you that razors are the only way to a perfectly shaven face. Electric shaver manufacturers will tell you that manual razors are a nostalgic but pointless endeavour. What is the truth of the matter? How do these methods compare and which will be more suitable for you? That's what I intend to address in this article. I will cover the pros and cons of each method, concluding with some final points to consider. It's true, cutting your facial hair directly with some form of blade will give you an unparalleled level of closeness. With electric shavers, there is a buffer between the blades and your face; as opposed to the direct contact with a razor. 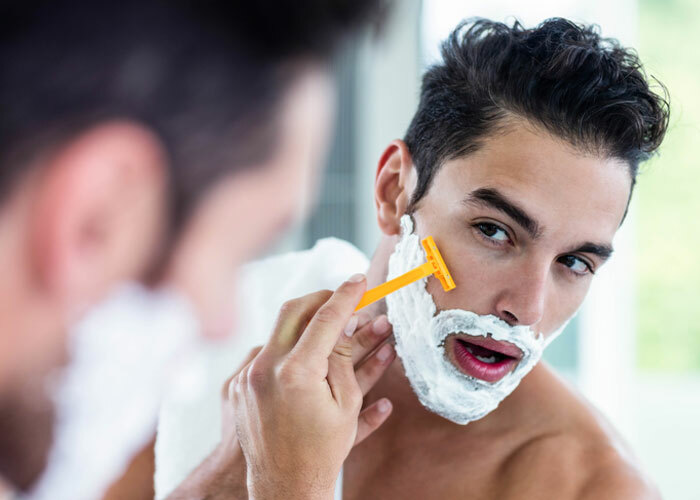 Disposable razors slice further down the hair follicles, closer to the skin, providing a shave that leaves your face feeling smoother and also lasts slightly longer (before you have to shave again). In the short term, disposable razors are the cheapest way to shave. An initial purchase price of below £10 for the handle and several heads, this can't be beaten. The rise of monthly online order razors has increased competition and driven down prices to new levels. There are many alternatives to the traditional Gilette, such as Dollar Shave Club and Boldking to name a couple. For many men, this is the biggest selling point. Some won't even try an electric razor, because they love the masculine ideal of applying shaving cream and using a manual razor in front of a mirror, as their forefathers did. For me, this isn't really a factor. I prefer the usability aspect of razors and how they impact my day to day life. However, this is down to personal preference. Manual shaving may give you the closest shave, however, this comes at the cost of a much longer usage time. Applying shaving foam, shaving and then rinsing everything takes a significantly longer amount of time than using an electric shaver. This can affect your morning routines if you plan to shave multiple times per week. Obviously, using an exposed razor comes with a risk of slicing yourself. Usually, provided you aren't clumsy and are using appropriate lubricant, this isn't an issue. However, disposable razors are much more tricky to use in tight areas such as under the nose and around the chin. Despite the initial purchase cost being relatively cheap, most decent disposable razors will end up costing more in the long run than a single purchase electric razor. Heads, and sometimes handles, will need replacing, as will lubricant on a regular basis. These small costs do accumulate, so for the ultimate money-savers out there, may be a deciding factor. Electric shavers don't require shaving cream or much careful usage. You can get straight down to the job of shaving and easily be finished in under a minute if necessary. If you are someone who works long hours the time saved by doing this, rather than manual shaving, may prove useful. Electric shavers evidently cost more to initially purchase, however they typically prove to be the more cost-effective choice in the long run. You do have to charge them, however, there are no monthly replacement blades and lubricants to worry about. It is almost impossible to cut yourself with an electric razor. They perform very well around the mouth area, where manual razors can prove difficult to use. Maintenance isn't much of an issue. You can use the majority of them dry or in the shower nowadays too, a versatile tool. Many shavers come with beard trimmer attachments, to allow you to use them for maintaining different lengths of stubble. Also, the precision trimmer attachments are extremely useful. Fantastic if you are looking to trim the hair falling over your ears. These are things you just can't do with razors. The foil area of electric shavers prevents the blades from contacting directly with the skin; great for safety but not so great if you're after a super close shave. Most modern electric shavers perform well, however you may have to shave more frequently than with a disposable razor. Electric shavers check in at a much higher initial purchase cost than disposable razors. You should be paying at the very least £30-40+ if you want a shaver that works well. This may be some barrier to those with a lack of disposable income. Despite electric shavers having been around for a long time, they are still not viewed as romantically as any form of a razor. You don't get the shaving 'experience', lathering up in front of a mirror doesn't happen, and this factor alone is enough to put some men off. For me, and I think for most men, electric shavers make the most sense. They are the simplest, fastest and easiest to use and make for the best everyday option. Razors have their perks, and I like to use them for the occasional super close shave, but I find them to be much more of a hassle. I use an electric shaver almost every day. If I was a millionaire with plenty of time on my hands, I would probably use some form of a razor; alas, this is not the case! Nevertheless, that is just my opinion, it is up to you to decide, using the information provided, which will suit your requirements.